As many magicians realize there has been a bit of a battle going on behind the scenes about the AMA/Magic Castle. Since Milt Larsen has been silent on the matter, I certainly didn’t want to jump in withy opinions. However I want to take this opportunity to re-blog his recent blog post. This is my sort-of-weekly blog. Normally I try to be light and bring back the days when I used to have fun writing the Friday lunch menus etc. I hope through the magic of the Internet every member of the AMA and all our friends will read this. I would like all of our members to understand the problem that we now face. In respect to the Larsen Family I have tried to avoid comments especially since it will now be in litigation. MILT LARSEN IS NOT THE BAD GUY! In reading Maurice Newman’s excellent financial report in the March Academy of Magical Arts newsletter I feel I have been quiet long enough about the question of the AMA’s payment to my Magic Castles Inc and Brookledge companies. Members are being told that I am hampering the possibility of the AMA buying the Glover property because they are paying me a huge amount of money for the right to use the name Magic Castle. This is not true. I have been painted as “the bad guy” over the past many months of newsletters and Board of Directors Minutes. In the March newsletter in Maurice’s report mentions: “Looking at our operating costs, rent approximates $700,000 per year and payments for creative services to Milt Larsen amount to well in excess of $400,000 per year.” On the AMA books I am being paid that money for “creative services.” That’s true, but what is the definition of “creative services?” In my book that’s the royalty of 5.5% of the food and beverage sales at the Magic Castle as agreed upon by every Board of Directors since the inception of the club until recently. It is a fee in payment for my conceiving and physically building a Magic Castle clubhouse at no cost to the AMA, which includes the rooms of antique paneling, chandeliers, bars, art glass windows and ceilings, gimmicks and trademarks. This past year the total gross of the AMA was in excess of $12,000,000. The $400,000 paid to me amounted to 3.33% of that income. As a writer I am a great believer in the rights of “Intellectual Property.” Inventors, authors, songwriters, artists, etc. deserve compensation for their work as long as it is enjoyed by future generations. 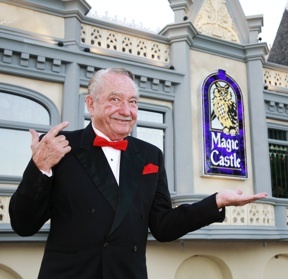 After spending a half century creating a world famous facility and trademark I can’t tell you how much I am saddened by the fact that Magic Castle name is not to be found anywhere in the club. This year’s Founder’s Day was all about the founding of the Academy of Magical Arts. As far as that event goes the AMA acts as if the Magic Castle no longer exists. In 1961 when my brother Bill and I talked about the idea of a club for magicians we made a deal. He would put together the magicians and regenerate the Academy of Magical Arts and I would lease the old mansion and turn it into my concept of aMagic Castle. Bill did his part and I did my part. Bill followed our father’s dream of organizing a fraternal club to advance the art of magic. I envisioned a physical attraction where the magicians could have a grand place to perform and provide a magical entertainment experience. Through hard times and good times the Academy became the talk of the magic world and the Magic Castle became a popular destination to magicians and the public alike. For four decades the AMA and the Magic Castle were synonymous. Now the AMA wants to change that. At the request of the AMA there will be a mediation hearing on April 15th before a retired judge. The judge will attempt to resolve the AMA’s position that it should no longer have to abide by the contracts it signed. Whatever the judge recommends I will support the AMA and continue promoting the art of magic in our various projects under the banner of Magic Castle’s Inc. Almost every night that I am at “The Castle” I am hanging out with old friends. New members thank me for creating the most unusual non-rock club with real wood and fun stuff. Other members thank me for creating their home away from home. Older members introduce their kids and grandkids. It is a very warm and happy feeling. Maybe so Erika, but please remember the Friars Club, one of Hollywood’s most prestigious clubs, was closed because the famous members felt it was no longer a theatrical club. Then there was the 50 year old Masquers Club in Hollywood that was sold because the new members thought they could get rid of all the old farts and buy a new club; the Hollywood Comedy Club that sold their longtime building never to rise again and the Troupers Club that once had the theatre on Las Palmas where we saw Dante perform his last show. None of them had the formula that had made the AMA/Magic Castle successful. The AMA/Magic Castle worked! The AMA has chosen its destiny – to become as important as the I.B.M., S.A.M., and the London’s Magic Circle. Bill and I only wanted the AMA to become the most talked about magic club in the world. For what it is worth, my opinion is clear cut and easy to state. With the record profits being made by the Magic Castle, I think Milt’s payments for services rendered and use of the Magic Castle trademark are a bargain! Without the Castle, the AMA is an overpriced IBM Ring or SAM Assembly. No Milt, No Castle! ~ by Nick Lewin on March 4, 2015. Nick thank you for sharing this. Hopefully every member of the Magic Castle will see this. As a long time member (1977) I have seen many changes but generally it was still the Magic Castle. These new changes threaten the very core of this amazing club. I am so happy Milt has finally shared his side. There is no Magic Castle without Milt and truly who the hell wants to be a member of the AMA, where is the history and prestige in that. I agree with you both absolutely!